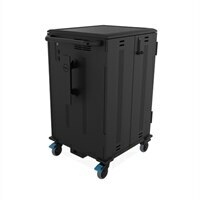 Dell Compact Charging Cart - 36 Devices CT36U18Efficiently charge, store and transport up to 36 devices in the Dell Compact Charging Cart. Now you can conveniently charge up to 14-inch Chromebooks, laptops, Ultrabooks and tablets with smart power distribution from Ergotron PowerShuttle 2.0 technology. Fit all your devices of varying sizes comfortably by adjusting the shelves and dividers in the cart. To keep your cart neat, simply route power cables through handy divider slots. For added convenience, install our optional docking kits for Dell Chromebooks and Latitudes-eliminating the hassle of routing cables to each device. The surface of the cart can hold up to 25lbs.-making it a great additional workspace. Rest easy, knowing that your devices are safe thanks to the cart’s 2-point locking mechanism and optional padlock. A 5-year warranty for mechanical components, 3 years for electrical components and 1 year for cables offer peace of mind. Efficiently charge, store and transport up to 36 devices in the Dell Compact Charging Cart. Now you can conveniently charge up to 14-inch Chromebooks, laptops, Ultrabooks and tablets with smart power distribution from Ergotron PowerShuttle 2.0 technology.